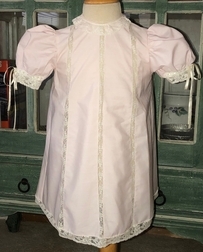 A lovely heirloom dress for baby and toddler girls for Easter, portraits, Christening, baptisms and other special occasions. We start with heirloom batiste fabric and make a flowing aline style dress. 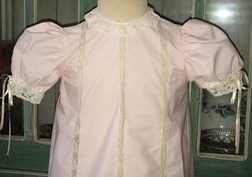 The neck, sleeves and hem are trimmed with French lace. The sleeves have floral embroidered beading with woven satin ribbon. 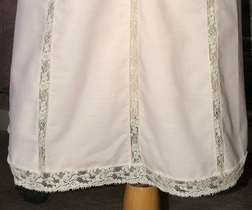 The dress has 3 French lace inserts between the front panels.